I haven’t done any bridals or weddings for awhile, and I can honestly say I don’t miss the weddings all that much. Don’t get me wrong, I enjoy weddings, full of happiness of two lives joining together into an expected bright future. Taking photos of the wedding is a whole different experience for me. I actually enjoy the challenge of photographing weddings, yet at the same time I have this underlying dread of “don’t screw it up!” Unlike portrait work, with weddings you don’t have the option of a do-over if you happen to get some settings wrong or miss those all important moments of the day. In the end, my clients have all been happy with the work I have done, so perhaps it is a little lack of confidence that nibbles at me on such occasions. Bridal shots though can be very enjoyable because in essence they are just a very special portrait session. The dress is typically full of detail, and the bride is all too willing to take as long as you need to get fantastic shots of them in their exquisite gown. I usually try to schedule a bridal session well in advance of the wedding itself, never on the wedding day as there is so much else for the bride to worry about on their special day. Today’s photo was the exception to that rule. I showed up an hour early for the ceremony and met the bride for the first time; again something against my typical preferences. As a photographer, though, when things are not as you have hoped, act like they are and go with it. This message is one I have always worked by and was repeated in the photo seminar by Kenneth Linge I participated in last weekend. I hope this is one photo he would approve of given his vast experience and talent. I have been busy on a somewhat arduous yet enjoyable task lately…organizing and cataloging my photos from 2007. This task has been long overdue, and there is quite the number of photos I am dealing with. I may write up a post soon about the process I am going through. Unfortunately I have been so wrapped up in it that I have simply forgotten to write up a post in the last couple of days. For today’s post I decided to pull some photos from the archives I am working through, back to last April. Today was a particularly blustery day here in Utah, so I figure some photos of the sun that is to come isn’t such a bad thing. Last year we did some camping in southern Utah with some friends and passed by the Manti LDS Temple on our way to and from. We stopped on the way back for a walk and some photos (of course). Whenever I photograph a building, particularly a popular one, I am always wondering what is the best angle to take the photo from. I always make a conscious effort to capture the “obvious” snapshot that everyone else takes, because, well that obvious shot is usually a pretty good one. But then I feel compelled to try and take things from a different angle than the norm. I enjoy coming home and looking through the photos I have taken and seeing which out of the various angles I end up liking best. I would call this first shot (above) the most popular as it shows the entire building from the hill where they hold the annual Manti Pageant. It does take a bit of a trek to get in position for the shot, but well worth the view. As I traveled around the building, I snapped a few other shots from perhaps other typical vantage points, and some less typical. So, my question to you is, which do you prefer. Or, perhaps, do you think I could have done better and how? Honestly I wasn’t attempting to create a work of art while snapping these shots, hardly possible when you have kids in tow and no time to plan a shot or wait for the best possible lighting. That aside, I was happiest with the last shot for perhaps being the most interesting with the trees in the foreground. There is a little more obstruction of the building than I think most would like, but I rather like how the building just pokes out from the trees. All in all, I think the message is my typical one. Take all the vantage points, it doesn’t cost you more! In the world of digital you can always toss out shots later if you must. Half the fun is searching for creative ways of viewing things in ways that others may not notice. Canon 20D, 28-135, various settings. Today I had the pleasure of attending a seminar taught by Kenneth Linge in Salt Lake City. As I took photos of various set ups and scenes for a “visual memory” I was reminded of the phrase “standing on the shoulders of giants.” The spirit of these lessons were more to teach us to fish on our own, which is what I enjoy. No matter how much I learn or think I know, there is always so much to learn. That is one of the many things I love about photography. I have met Lance at some of the recent concerts, but not really gotten to know him. Hopefully we can cross paths again in the future. He is a talented musician. Taking my snowy orchard photos yesterday, this sign greeted me where I wanted to take the photo. I take pause when told to keep out, and generally respect their wishes. Today I went ahead and traversed 10 steps onto the property to compose my shot. My question is whether you think this is violation of the intent of their sign, or if I was in good faith not trespassing in a way that they are trying to keep people out. I have read many photoblogs where the photographer feel ok disregarding signs such as this on a regular basis. I don’t consider myself above the law, nor do I regularly try to ignore others wishes, but in this case I thought I was within the intent of the property owners protection. On my morning excursion yesterday to take some snow pictures, this barrel struck me with is colors in contrast to the expanse of the snow. I am not sure if it is the rust or the almost dreamy feel of the snow in the foreground that I like. Sometimes it is just the feeling that the photo creates that strikes you more than the actual subject of the photo. The other day I realized I really haven’t gotten myself out at all this winter to try and photograph the beautiful snow we have been receiving. This morning I decided to go out for a few minutes and try and rectify that situation. This is a local orchard that is one of the few hold outs against the urbanization of the farm land that was so prevalent in this area not that long ago. I love the lines created by the rows of trees. I tried shooting this at various angles & with different things in the foreground, but I ended up liking the simplicity of this view. This is a photo of my Dad diving off of a sub in 1979. I am not 100% sure where it is, but likely off of Asia somewhere. My dad was an avid photographer that shot almost entirely in slides. I am currently in the process of scanning in well over 10,000 slides that he took to preserve them against further degradation. My dad is no longer with us, having died at the relatively young age of 50. His pictures are one of the most valuable records of his life (and mine) that we have. Taking random art pictures is fun, but remember to record the lives of you and and your loved ones for those that will enjoy them for years to come. Capturing and archiving memories is an important part of why I enjoy photography. The archiving part is one of my biggest concerns lately as I reevaluate how I am storing the massive amount of data I am creating. Currently, when I am “done” processing photos and ready to store them away for future use, I burn 2 data DVDs copies of everything before I remove it from my hard drive. I take one copy to work and leave one at home; I figure that in the worst case scenario if my home burns down, I have a copy elsewhere to be preserved. In the more likely scenario, if one disc gets scratched or otherwise stops working, I have backup copy. The problem with my current solution is three-fold. First, my wife would like to get to photos periodically to scrapbook, and to do that she needs me to load up the discs for her so she can look through the files. Second, once I have the disc loaded, I have been storing my original DNG (digital negative) files, which keep all the original quality and resolution, but require Photoshop to convert to a useable format for her. Third, having all the photos spread across multiple discs is piling up in an disparate way that I find difficult to locate specific photos I am looking for. Many (large volume) photographers are now turning to NSD devices, which are essentially multi-bay hard drive enclosures that allow you to have your data spread across multiple drives in a way that gives you a lot of space and built in redundancy. For example, the Drobo unit I am looking at allows for 4 HDs to be placed in it, combines them all as one drive for the way your computer sees it, but also uses a RAID kind of backup so that if you lose one drive, you simply replace it and no data is lost. This solution is the path I would like to go, but currently for the space I would need, it is breaking the bank. Eventually I will get there, but this is one of those times I will stick to my old method long enough to let pricing go down a little before I jump on the next great technology. I just hope the next great after that to be released isn’t so spectacular sounding such that it keeps me waiting again for prices to go down! Today I am showing another photo from last year’s concert shots, this one of Tom Hopkins and Donny Osmond. One of the areas of my concert photos I am always trying to improve on is capturing interactions between the band. Often the expressions and scenes can be more appealing than the “solo” shots you capture of each individual. Of course both are important to get, but those interactions are often the gems because they are so hard to get. Getting the interaction can be difficult because there is typically a lot of motion involved in an already tough lighting situation, being in position to get the expression on everyone involved, and simply paying enough attention to realize that a great interaction is about to take place. In this scene Donny plays guitar for one of the songs he plays in his recent music set. Though Donny is quite capable of playing various instruments, typically he sticks to crooning at the mike. With guitar in hand there are several times that he hams it up with the lead guitarist or bass player. I have some other shots during this song segment that I will try and find post in the coming days. This morning I was asked by a family friend to come down to the local college and take photos of her dance performance. I typically enjoy being asked to photo events like this because it challenges me to take photos in less than desirable lighting conditions. Most simple performances have little thought or budget put into lighting. As seems also to be typical, when I showed up at 8:30 and perused the program for my subject, she was in the last performance of the show. Great. Actually I try to stay positive at times like this because I can use the time to try and grab other photos simply for the fun of it, and hopefully find things artistic or interesting to snap. The lighting was extremely dark, so I needed every bit of the 2.8 aperture my lens could offer and 1600 ISO that my 40D gratefully provided with minimal noise. I have a few others from the show I plan on posting, but this first one was one of my favorites. 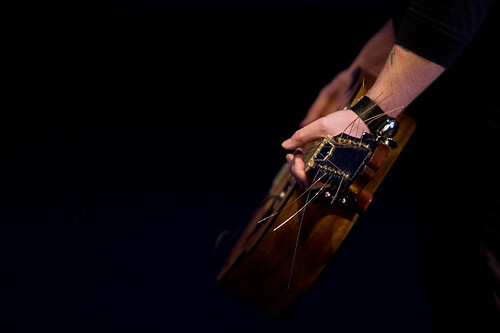 The guitar makes it seem like more of a concert photo, but this was one aspect of the overall performance. Honestly this particular performance was laughable on many levels; one of those students trying to be creative but just end up being really weird kind of performances. There were several interesting shots I was able to isolate and capture out of it though.